Riverbed explained that the SteelHead appliances perform WAN optimization in sites with highly contended bandwidth. The SteelFusion appliances offer both “hyperconverged infrastructure” and WAN optimization. For sites that have plenty of bandwidth, however, there’s no Riverbed product you can put there and that–for Riverbed at least–is a problem. Riverbed’s proposed solution? Ironically, it’s an appliance that can act as a WAN router, but with some rather unusual features. BGP and OSPF to exchange routes with adjacent MPLS CE routers, for example. Surprisingly absent from that list, however, is WAN Optimization. Despite being Riverbed’s core competency, this is not a feature of the Project Tiger appliance. Because the main focus is on moving packets through the appliance, Riverbed claims that this x86-based platform has high throughput. 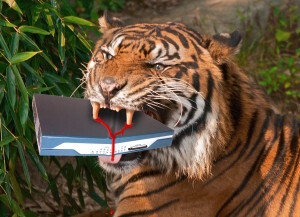 I was a bit underwhelmed by Project Tiger as a WAN router. After all, ZTP and centralized management are now mandatory checkboxes for any SD WAN solution and BGP and OSPF are commonplace. However, two of the concepts changed my mind: : containerization and service-chaining. These features have the potential to transform Riverbed’s entire product line. call it “Project Leopard” and sell it in place of the current SteelHeads. Next, “Project Snow Leopard” can add yet more storage, RAM and CPU cores, containerize the features of SteelFusion and replace that too. This would give Riverbed one OS across all platforms and offer customers the option to deploy the same containerized applications (whether Riverbed or third party) throughout an enterprise’s entire network. This one Riverbed appliance might just replace a whole host of network devices in branch sites while still giving the benefits of a “best of breed” multi-vendor environment if–and this is a big “if”–the top vendors are willing to put their capabilities in a container. If it turns out that the available containers are all sub par, it will seriously reduce the potential for a device like this. Hold on to your cash for a moment; Project Tiger will get a formal marketing name and a product SKU some time in 2016, and initially at least, the form factor being sold will not be offering WAN optimization. Nonetheless, Riverbed is offering an intriguing product that they claim will simplify management while extending SD WAN path selection and network visibility to places Riverbed could never go before. I attended presentations by Riverbed as an invited delegate at Networking Field Day 10. Vendors pay money to present to delegates, and in turn that money funds my transport, accommodation and comestibles while I am there. That said, I don’t get paid anything to be there, and I’m under no obligation to write so much as a sausage about any of the presenters, let alone write anything nice about them. So if I do so, you can rest assured that I’m saying what I want to say, and I’m writing it because I want to, not because I have to. You can read more here if you would like.